Azerbaijan! “Azerbai- what?” This was a typical reply I would get when I was telling my family and friends I was heading to Baku, Azerbaijan. 95 percent of them had never heard of the country nor could pinpoint it on a map. Fair enough. When I first heard of the country a few years ago, I also had to google where it was located. I must say since visiting the country, now I’ve heard of so many people traveling or living there. Funny how that works. Azerbaijan is a country in the Southern Caucasus region just between Southeastern Europe and Southwestern Asia. It borders Russia, Iran, Armenia, Georgia, and Turkey. This country is really at a point geographically where East meets West. It’s exhilarating, and if I dropped you off there with a blindfold and left you in the city, you would probably struggle to know even what continent you were on. It is such a variation of so many places. It’s so so clean and the streets are litter free and pristine. It reminds me a lot of Singapore. The bay and boardwalk also reminded me of Singapore with the ferris wheel next to the sea. The Architecture is so vast and varied. It’s a mix of Paris, Tehran, Istanbul, and Dubai. Speaking of Dubai, Azerbaijan reminded me a lot of it because of the wealth. Due to oil, there is a lot of money in Azerbaijan. It’s not uncommon to see Rolls Royces and Lamborghinis driving around regularly. There are a lot of malls and high end stores as well as fine dining and nightlife. It really did remind me of Dubai, but with less strict Muslim laws and more friendly welcoming locals. Azerbaijan is a Muslim country, however it tends to be more liberal than its neighboring Muslim countries and even some of the nearby Christian countries. They drink alcohol in Baku, have cinemas, and don’t enforce the strict dress code that say Dubai and other Muslim countries would. Most women don’t cover their heads as you might see in other Muslim countries. There is also not a huge amount of Mosques in the city and you will hear no loud prayers over the city like in Dubai, Istanbul, Tehran, etc. It is also so safe. I felt very safe while I was there. I was a solo female traveler and I walked the city alone for three days and never felt threatened or as though I was in danger. Azerbaijan used to be an ex-soviet country so you will also see the Soviet influence here. Many of the people speak Russian if not Azerbaijani or English. They love their tea, nuts, and vodka. The food is lovely and you really can find most cuisines here. It truly is a mix of everything good with so much history and influence. The true definition of East meets West. I flew Azerbaijan Airways into Baku which was a really nice airline. You MUST have an Evisa upon arrival as an American to enter the country. It used to be quite hard to maintain a visa for Azerbaijan, but due to the government opening its borders and economy for tourism, they have thankfully made it a lot easier to enter. The airport is the nicest, most beautiful airport I’ve ever been into. It’s large, but actually fairly quiet. You will get in and out quickly after customs. My hotel THE FAIRMONT BAKU sent a car for me as I was unsure about the taxi system. As a solo female traveler, I find this is the safest way to go about arriving in a new and unfamiliar country, especially at night time. I arrived at THE FAIRMONT BAKU and wow! If you come all the way to beautiful Baku you must stay here. It’s located in the famous Flame Towers which are those three flame shaped towers newly built that light up the sky. They are some of the most alluring buildings I’ve seen. These are the first buildings you see when you search for “Baku”. The hotel is so large and beautifully done. It is well maintained and the staff was amazing, I have to give a huge shout out to Seid at the concierge because he was so helpful throughout my whole stay and really treated me like royalty. He also made an amazing list of the best restaurants, malls, and sites to see. The Fairmont is lucky to have him! I stayed in a room facing the sea and it was a beautiful view! The room was so big and beautiful. It came with a large walk-in closet and a huge bathtub. It also featured Le Labo toiletries which in my opinion are the best of the best. The gym was also so nice. I used it every night and it had everything one would need for a good workout while traveling. It even included a reformer pilate machine which I thought was seriously awesome and a great touch. The breakfast was top notch with so much variety! I couldn’t even have lunch after such a huge breakfast but I loved it! The food was delicious! I’m really glad I stayed there as it was in a great location to walk to almost all of the sites. The glow of the neighboring tower throughout the hallways was so beguiling. There really is no better place in Baku to stay. What does one see and do in Baku? Well let me tell you! First, walk from THE FAIRMONT BAKU across the street and see the Turkish Mosque. Then walk to the park where the genocide monument is with the eternal flame. Take some lovely photos there and then you can also get some selfies or photos with the Flame Towers in the background. Try and get both day and night photos of the towers as they look so different. 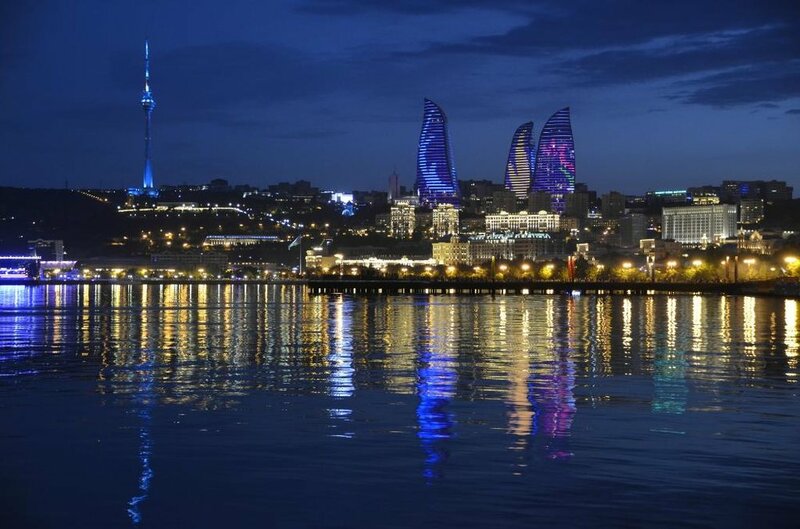 Then you can walk to the Baku ferris wheel also known as the Baku eye and get photos with it. You can even take a 15 minute ride on it to get panoramic views of the city. I would suggest from there getting a cab (always negotiate the price beforehand) or walking to The Old City. I always choose to walk even if its a little long. I feel this gives me the best chance to get a real sense of the city. Some roads in Baku are impossible to cross overland, so there are underground tunnels you must use. It’s very easy. Old City is really nice and full of old buildings that really look similar to Middle Eastern architect. There are people selling some really cool and cheap souvenirs, and they will welcome you with tea. Take the tea from them as a sign of respect. In this old town you will find some beautiful fountains and The Maiden Tower which is perfect for photos and has true Azerbaijani history dating back to the 12th century. It was built as part of the wall of Baku. Another noteworthy spot to see is The Heydar Aliyev Center built by Zaha Hadid. It has such a distinctive look with its curves and angles. Check out The Palace of the Shirvanshahs, Fountain Square, The Azerbaijan Carpet Museum, Bibi-Heybat Mosque, Azerbaijan State Academic Opera, Taza Pir Mosque, Palace of Happiness, and Mini Venice. 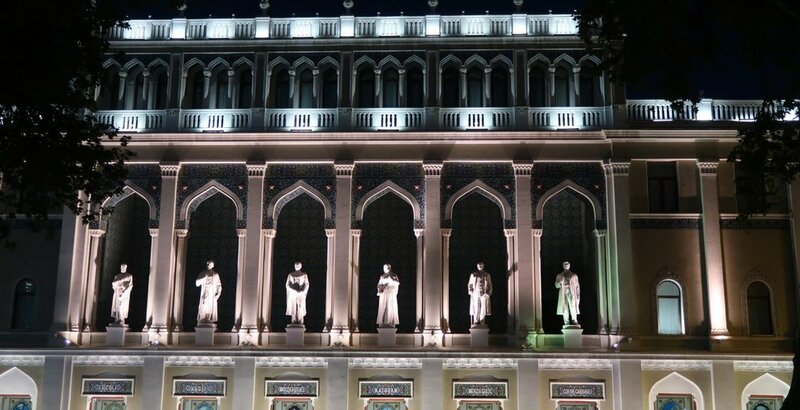 Additionally, if you are interested in museums, visit the National Art Museum of Azerbaijan, Baku Museum of Modern Art, Nizami Museum of Azerbaijani, and The Baku museum of Miniature Books. There are restaurants everywhere! A few I would recommend would be Chinar (my favorite), Restaurant Nargiz, Art Garden, Firuze Restaurant, Sahil, Mari Vanna, and also Vapiano which is a Italian chain restaurant. Regardless, I’m obsessed with it and eat it in every city that has one. This is a safe option for any picky American eaters. I love it. Another cute little cafe is Merci Baku. Try it out. In conclusion I had such an amazing time in Baku that I would love to go back in the summer when I can do some of the day trips to the mountains from the city. There really is a lot of beauty in this country and I hope more people travel here as I know they will love it! It’s off the grid for sure, but that’s the fun part of traveling. It gives you great memories and even better stories to tell people. Have the best time in Baku and enjoy it! There is amazing hospitality and it’s a peaceful, diverse, and fascinating city to explore. Give yourself at least 4 days here to enjoy it and see things at your own pace! Summer is obviously the most desirable time to visit Azerbaijan and if you do come then, try to escape the city and see the mud Volcanoes and James Bond oil fields outside the city. Take a stroll down the Bulvar. It's the longest in the world. Take the funicular for amazing views and it’s even free! Negotiate fares with the cabs before you travel otherwise they will charge you what they want. Make sure you exchange your money upon arrival to Manat. You cannot take photos of official buildings. I did this and got screamed at by security so be careful. Check out the Metro. It's beautiful to see and really cheap to use. If you’re invited into a local’s house remember to remove your shoes. Have so much fun and enjoy yourself while also respecting the locals and their customs. My 50th country! Celebrating in Riga at the Kempinski Hotel!